For good crackling, make sure the skin is very dry. Leave it overnight in the fridge to help it dry out. Then score the skin at 1cm or 1/2 inch intervals with a very sharp knife, or ideally, a Stanley knife, taking care not to cut too deep and into the flesh. Leave the pork to come back to room temperature if necessary. Preheat the oven to 240c/450f/Gas 9 or as high as your oven will go. This will get the heat through to the centre of the joint, and get the crackling off to a good start. Just before cooking, weigh the joint and then season the meat with salt and pepper and sprinkle the skin liberally with salt. Do not do this in advance or it will encourage moisture which is the deadly enemy of crackling. Put the pork into a lightly oiled roasting tin, skin-side up and roast towards the top of the oven for 20 minutes. Then reduce the oven temperature to 180c/350f/Gas 4 and continue to roast for 25 minutes per 500g. Remove the pork from the oven and piece the centre of the meat with a skewer from the underside of the join. There should be no traces of pink in the juices. 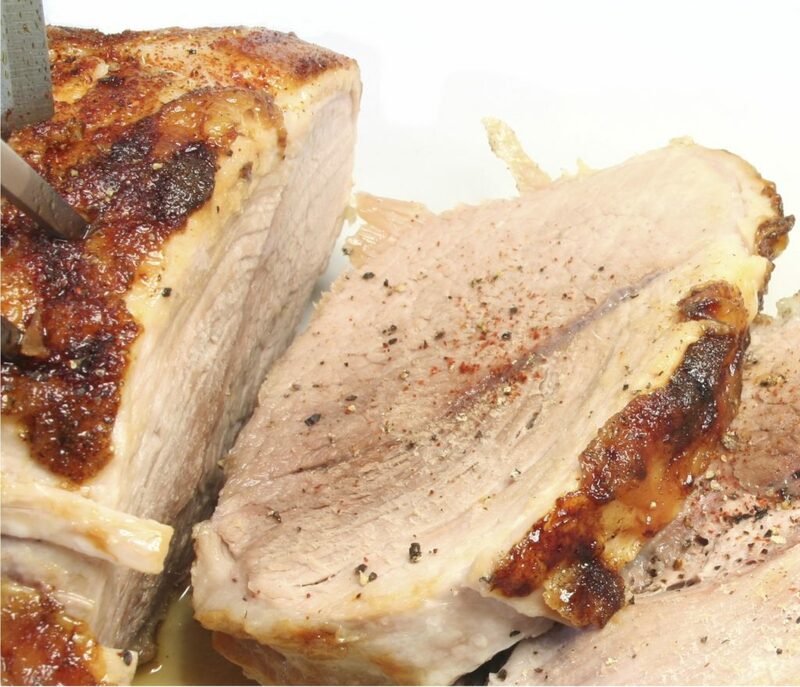 Clear juices will indicate that the pork is sufficiently cooked and the meat is sill beautifully moist. No juices will mean that the pork is over cooked and dry. If you have a meat thermometer of some sort, also check the internal temperature of the meat. It should be 75c/170f when you remove it from the oven, and will continue to rise to 80c/180f while it rests. Lift the Pork onto a board and leave somewhere warm to rest for 10-15 minutes before carving. But do not cover or your crackling will start to soften.